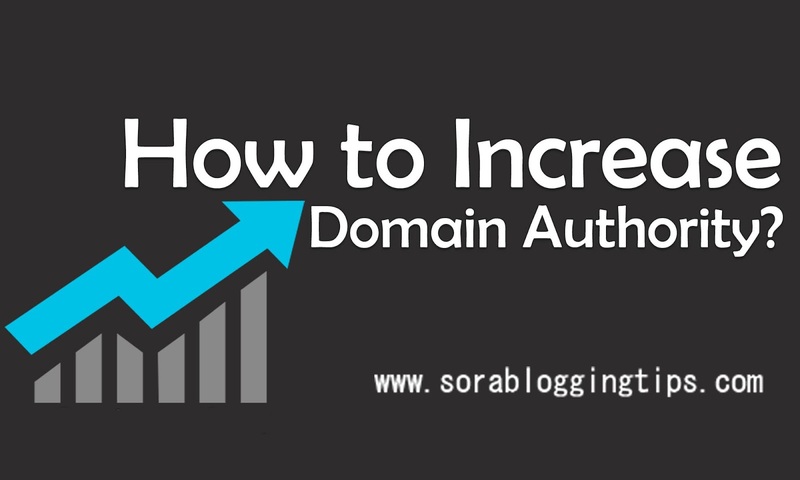 Today we will share some tips to increase domain authority of your blog or website. Basically Domain Authority is a kind of rating method just like Google pagerank or Alexa rank and it represents the power of a domain name and it helps to predict how a website or blog will perform in SERPs (Search Engine Result Pages) and search engine rankings. In general words Domain Authority is based upon the popularity of the domain or website and the number of links which are pointing back to your domain. but also the age of the domain and the size of the website matters a lot in Domain authority rankings. If you are concentrating on Google Pagerank or Alexa rankings then we recommend you to concentrate on Domain Authority Rankings too because if you will have good domain authority rankings than your Google Pagerank and Alexa ranking will increase too. let's see some facts and factors which will help you to increase your Domain Authority. Domain Authority Is Important Or Not ? If the above question is coming in your mind that the Domain Authority is important for a website or not ? than let me clear that it is one of the most important ranking and high priority thing for a blogger to do. Basically Domain Authority helps you to boost up your chances to get advertiser as advertiser mostly concentrate on domain popularity and rankings. Basically the facts is that the more domain will be old the more it will score good in Domain Authority rankings and as you know reading the above paragraph that if you have good score in domain authority than it means you will have good Google pagerank and alexa ranking and number of backlinks too. We score Domain Authority on a 100-point, logarithmic scale. Thus, it's easier to grow your score from 20 to 30 than it would be to grow from 70 to 80. Actually Seomoz measures the page authority too in that case they said that "Whereas Page Authority measures the predictive ranking strength of a single page, Domain Authority measures the strength of entire domains or sub-domains." Now after reading the above article we think that you have cleared all your doubts about Domain authority and also you got to know the basics and advance factors involved in Domain Authority Calculation. So lets take our discussion to the next step, as we said in the beginning now we will discuss what can you do to improve your Domain Authority rankings. Now what about Domain popularity, Yep !! It is also a important term in Domain authority calculation but it depends on Domain age and backlinks as you know the more your domain will be old the more it will be popular. So when your site will be enough popular than you will automatically get some huge numbers of incoming links from various sites. So if you have more incoming links than outgoing links than you will going to have good domain authority ranking. This is the most important factor in domain authority calculation because the more quality backlinks you have the more chances you will get to improve your domain authority rankings.So just start making backlinks to improve Seo and domain authority ranking of your blog or website. You can make use of following things to increase the number of backlinks for your blog. Basically this has become most easy and famous but good and trusted method to increase the number of backlinks for your blog. These days lots of high PR blogs are using comment luv plugin to get huge numbers of comments on their content. Some days ago this was the best way to increase backlinks of your blog but due to some changes in google's term and policy this has been affected little bit but still lots of bloggers are doing guest posting to get some high pr backlinks. There are lots of online tools and addon's to check the domain authority rankings of your blog or website. You can try Seomoz, Google toolbar, Open Site Explorer or you can give a try to Moonsy which is one of the best tool to check domain authority ranking. We hope that you liked this article and maybe this will help you lot, Basically Domain authority is also an important part of blogging because the advertiser demands about it. Soon we will publish some quality widgets too. If you have any query about this article don't hesitate to comment we will reply you as soon as possible. Peace and Happy Blogging.